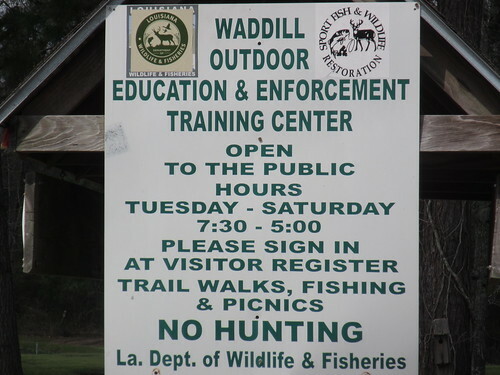 Waddill Wildlife Refuge, also Waddill Outdoor Education and Enforcement Training Center, is located along the Comite River between BREC’s Blackwater Conservation Area and Frenchtown Conservation Area. 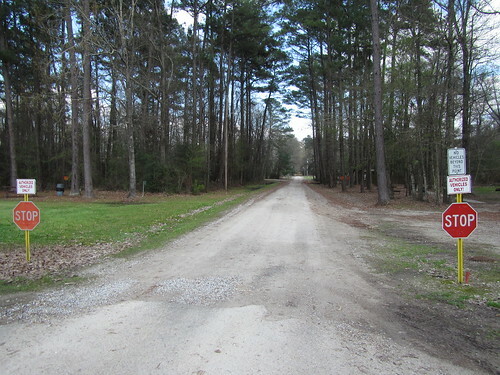 It is open to the public Tuesday through Saturday, and the 0.4-mile walk between the Comite and parking is slightly less than Blackwater’s 1/2 mile and Frenchtown’s 2/3. Upon arrival at the parking lot, you are required to sign in at the sign-in station on the left (pictured at top). Once you’ve parked and signed in, access to the Comite is straightforward. Literally straight forward. You are not allowed to drive beyond the end of the parking lot, but the gravel road makes the going easy enough. To your left and right as you walk along the road, you’ll see the various ranges (archery, air gun, and so on). Eventually, you run out of straight road. When you do, you curve slightly to the right and see this fork in the trail. 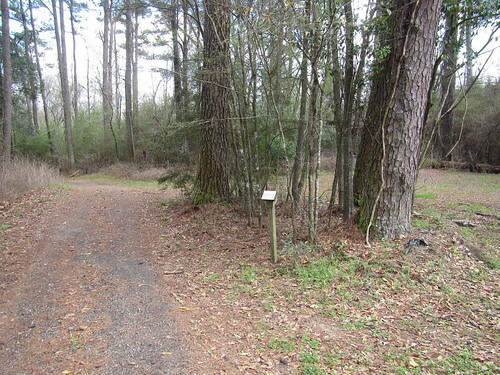 To the right is the Swamp Loop of the Waddill hiking trails. 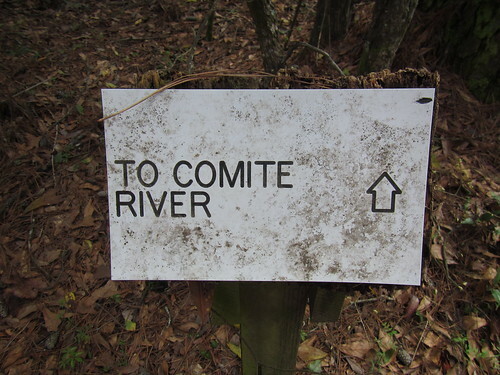 To the left is the path to the Comite River (which bears the signs of vehicle use). You can almost but not quite see the river from the fork, but the sign should give it away. Actually, the arrow should probably point a bit to the left, as the sign’s on the inside of the fork, but if you get lost here, well, exercise is good for you, right? 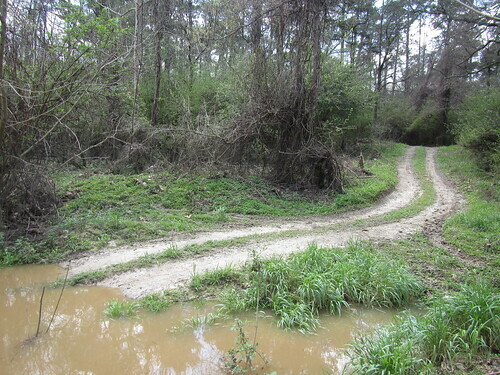 The trail curves left, then right, and drops you off on the bank of the Comite. If the river is high, the tracks drive right into the water. At lower levels, they shouldn’t be too hard to spot from the water. 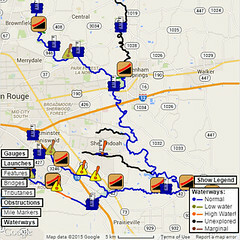 If you paddle from Blackwater Conservation Area to Waddill, you will paddle about 7-1/4 miles downstream on the Comite River. You’ll have half a mile to walk you boat from the parking at Blackwater, so a canoe/kayak dolly is convenient. 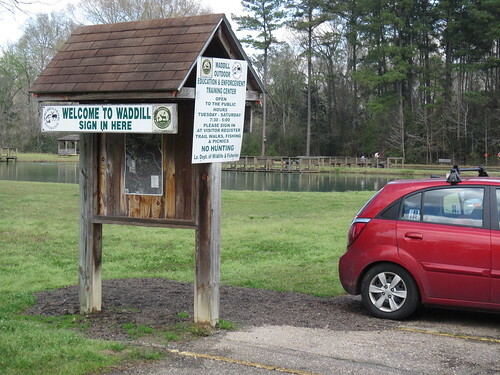 Once you reach Waddill, you’ll have a bit under half a mile to walk back to the parking area. During low water, you may hit shallow sandbars along the way. Also, at low water Cascade 1 may show itself, so if you see it, just point one of the pointy ends straight ahead and enjoy the ride down the very easy “rapids”.